Standard seal construction will accommodate +/-25mm in any plane. Each seal is supplied with fitting instructions, adhesive and stainless steel worm drive clips to suit pipe and spigot diameters. For diameters of 350mm and above ‘double clipping’ is required. The clipping length or cuff (B) is 30mm for single clips and 70mm for double clips. 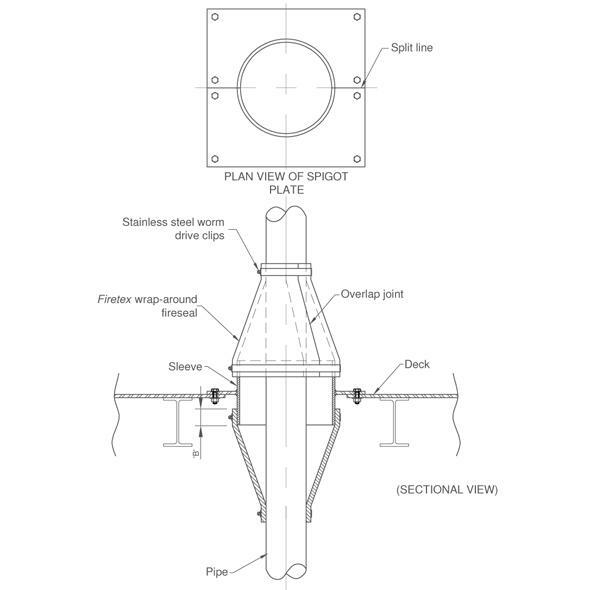 The deck penetration solution featured here may also be applied to a bulkhead penetration. Spigot plate may be supplied by MCL if required.